I’ve been using gnuplot since.. like forever. It is one of my best friends in plotting data and discovering what is going on. But for all its greatness, you do tend to run into a wall - once you step outside the things gnuplot is good at, suddenly large heaps of awk, sort, unique and odd shell scripts are required to get to the next level. This is no criticism of gnuplot - it is great for what it is for. And to be sure, gnuplot’s fitting abilities for example go beyond what could be expected of a plotting package. While sometimes quirky, the fit f(x) functionality has helped me discover a lot of interesting things. I love gnuplot. But it is time to move on. 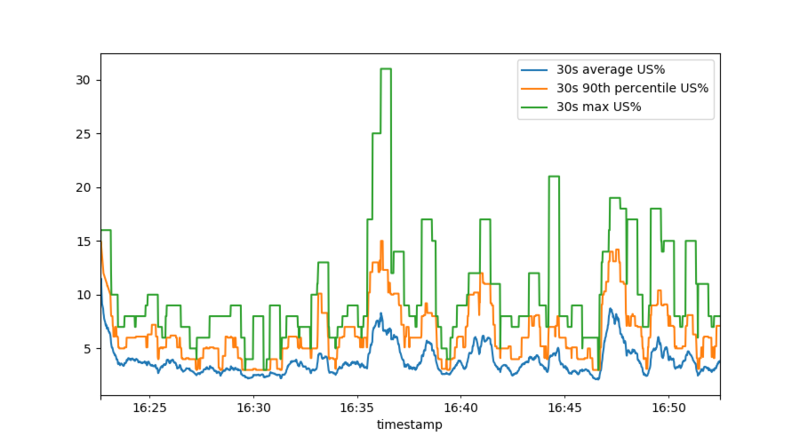 In this post, I hope to provide a highly accessible introduction to Matplotlib and Pandas which, together, blow gnuplot right out of the water. Note: I am by no means an expert or seasoned user of Matplotlib and Pandas. In fact, I started this trek only a few weeks ago. If you spot any mistakes or “worst practices” in here, please let me know (bert.hubert@powerdns.com) and I’ll fix it. A few actual experts have looked at this page and did not immediately report big problems. 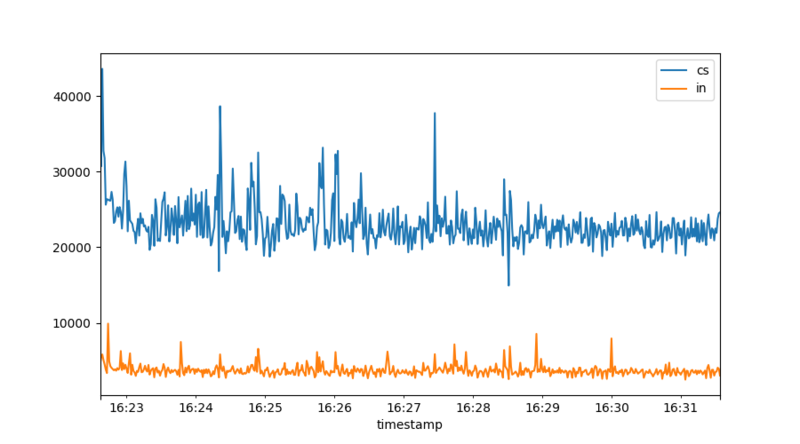 Gnuplot is ready to go. Other graphing solutions require configuration, web browsers and other newfangled things. It is not easy to let go of such commandline ease of use. 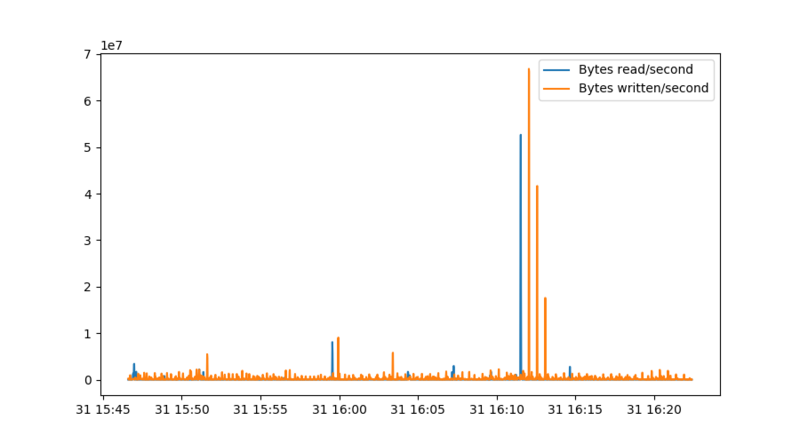 The example above however did show that quite a lot of the work gets done outside of gnuplot - we needed a somewhat awkward awk program to preprocess the output of vmstat before gnuplot could get to work. 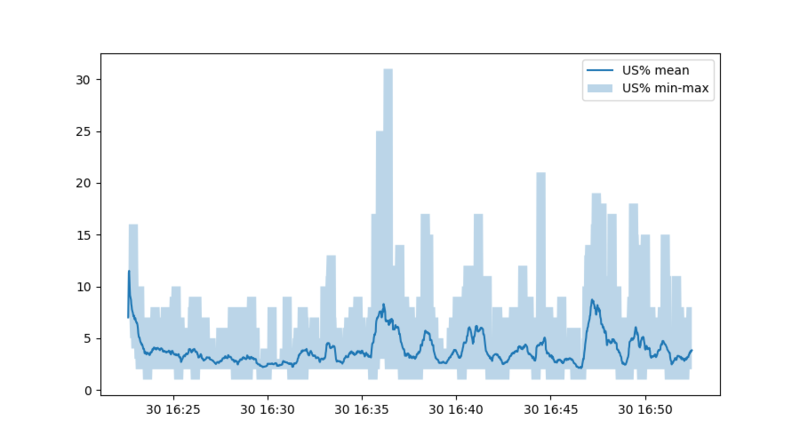 Gnuplot meanwhile has no idea what it is plotting - it only sees numbers. 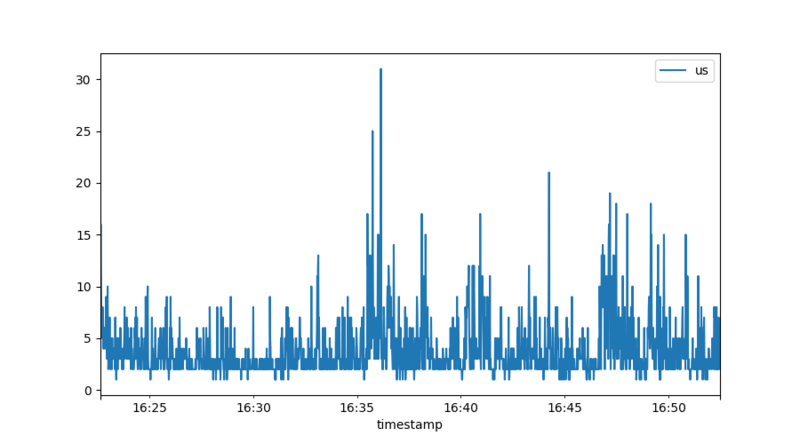 Gnuplot itself can read data from a prepared file. In the brave new world of Pandas and Matplotlib, data storage is separated from the actual graphing as well. But it does all reside within one programmatical environment, where data is labelled with what it is. We can let this run, the file will grow as it happens. This takes the timestamped output from vmstat but replaces the UTC field in the header by two fields called ‘Date’ and ‘time’ - since it is actually two fields. The first line says this is a csv file with whitespace as a separator. The skiprows statement means we skip the first line of vmstat output, which contains a summary, plus the first actual data line which contains statistics of the system since bootup. 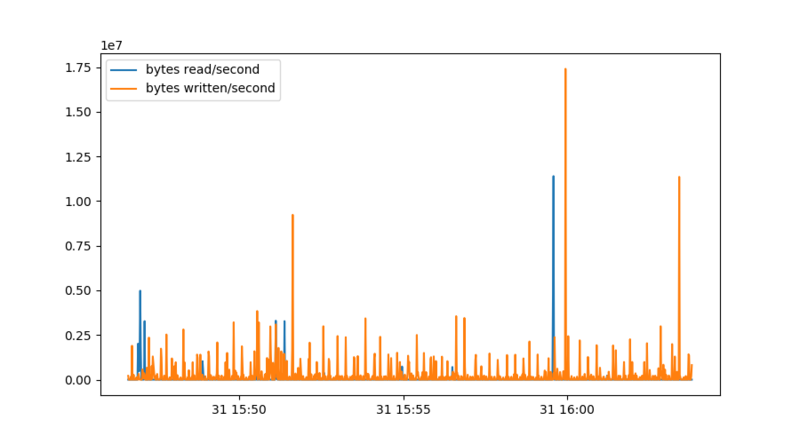 The second line converts the pretty printed vmstat timestamp into a ‘native’ Pandas timestamp. Note that we explicitly say these are UTC timestamps. The final line then blesses the newly generated timestamp field as the index of our data. 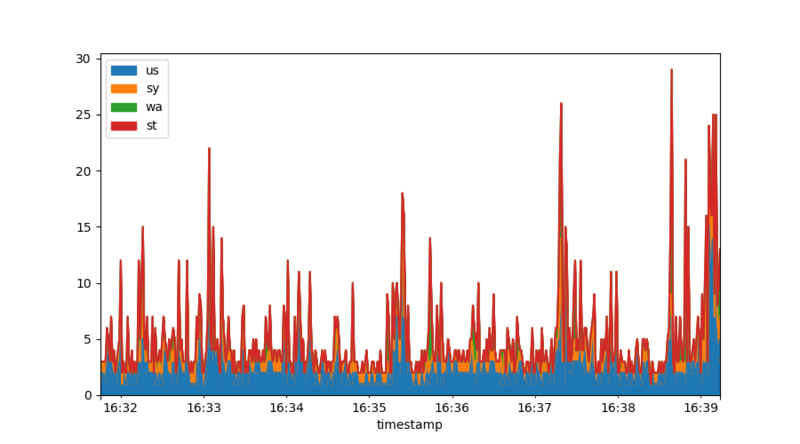 All vmstat fields are available for plotting. Note how the graph is automatically time aware. 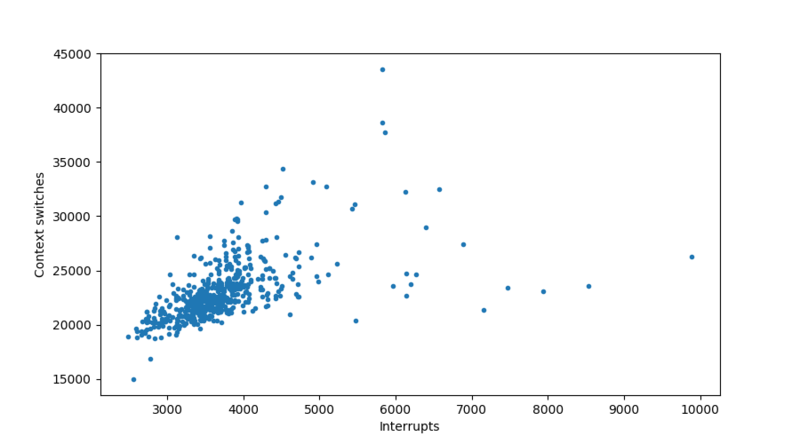 There is also an automated legend to show us what we plotted. But does it scale? All this newfangled stuff, surely it can’t deal with millions of lines? Turns out, the Pandas people have been at it for a while. I routinely process tens of millions of datapoints with Pandas and read_csv is up to it. read_json not so much though! The third line is somewhat interesting - this calls on Matplotlib to fill the area between the minimum and maximum user CPU percentage, but uses the original timestamp from the data variable. This provides a summary of our data (where not all fields fit on this screenshot). But already this summary tells us something - we have 1793 lines of data. And apparently, our system does sometimes swap data! Both si and so are mostly zero, but not always. From the 25%, 50%, 75% percentile numbers (which are all zero) we can see these swap events must have been bursts. Oftentimes we will get metrics that represent things like “the number of bytes read since startup” - to make any sense of these numbers requires us to take a derivative. In this section we’ll cover how Pandas deals with this. This follows the same pattern as earlier, except this csv file requires no preprocessing in terms of skipping lines or joining fields. On line two we bless the output of date +%s as the timestamp and again mark it as UTC. The unit='s' part tells Pandas these are unix timestamps. We then bless the timestamp as our index & output the first 10 rows to check if it all parsed right. Some things should be noted about this graph. 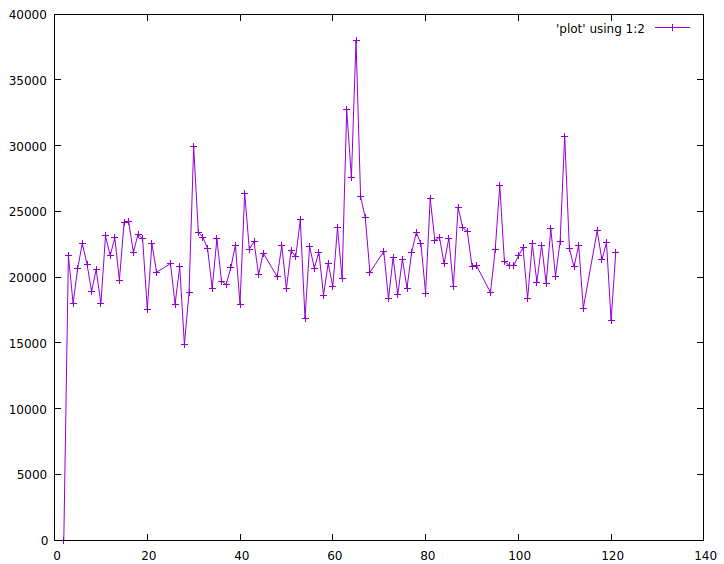 We could simply use diff() to get per second graphs - because this data was collected every second. To combine datasets, collected from different places, often requires us to match up data with non-coincidental timestamps. Think of two systems being polled every 30 seconds.. but not exactly on the same second. In addition, datasets may be noisy at small timescales yet exhibit trends on longer scales. For example, our diskstat data contains both the number of read requests and the numbers of sectors actually read. If we want to find out the average read request size, we need to divide these two numbers by each other. If we do so on a per second basis, we are unlikely to get a meaningful graph as some requests may be issued in second n but only executed in second n+1. Both combining data with slightly different timestamps as well as doing math on noisy data are solved by the Pandas resampling facility. 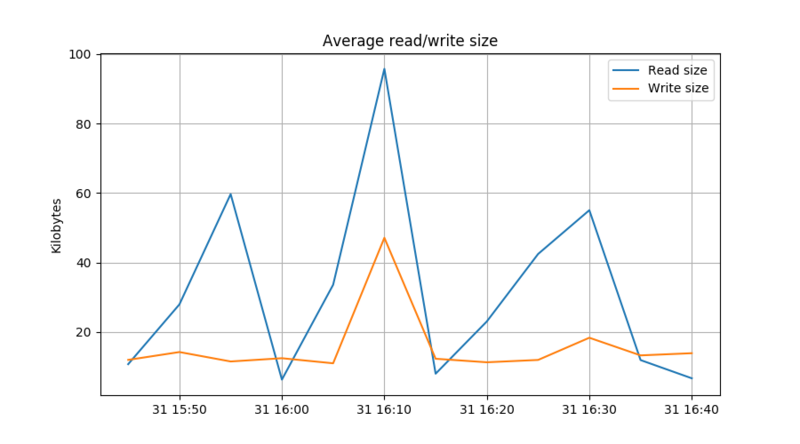 In the first line, we resample the naive diff() of the number of reads at 5 minute intervals. In the second line we do the same for the number of bytes read. The next two lines repeat this for writes. The plot.plt() lines are interesting because they show how resampled series can be used for calulations. This would select only sdb’s wrsectors metric, calculates its derivative and tell us the 99% percentile value - a metric of the read performance a disk would have to provide to keep this system satisfied 99% of the time. Ok, enough of this hotness, how do I get started? 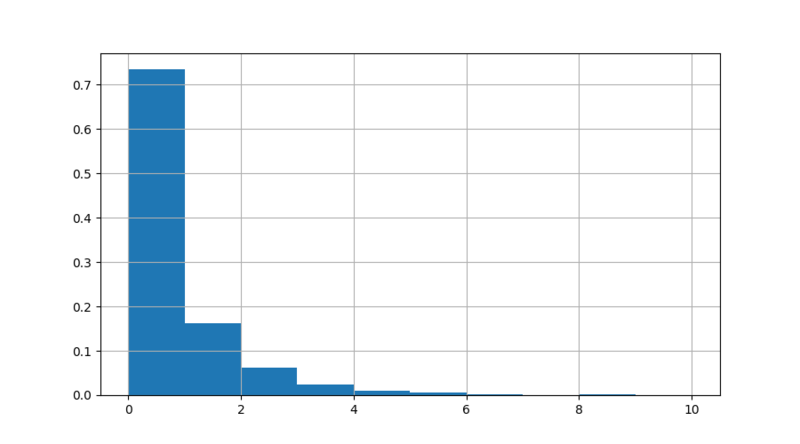 The easiest way to use Matplotlib & Pandas is through Jupyter. This is a webbased environment that offers a smart “CLI” interface to Python, except that it is graphical and you can do and redo commands at will. 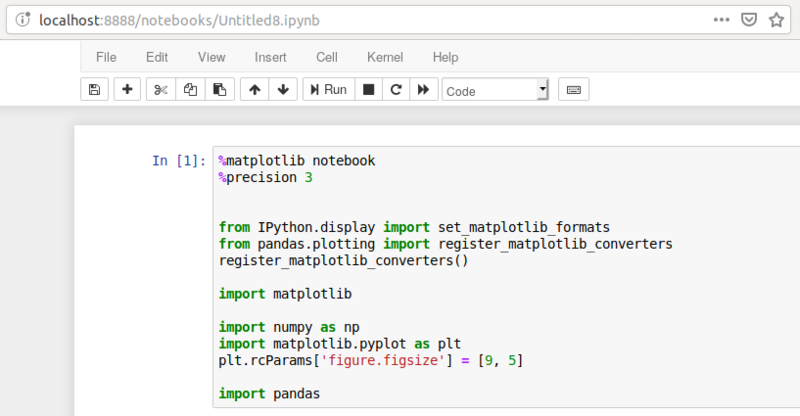 You can then start Jupyter with something like jupyter notebook or perhaps ~/.local/bin/jupyter notebook. This will launch a webserver and will point your web browser at it. This sets up sensible defaults. Then press the little ‘Run’ button and it will execute the first cell. You are now ready to go! I have published the source of this article, the Jupyter notebook, the diskstat tool and a diskstat.csv and vmstat.csv dataset on GitHub for you to explore. For further reading, the Matplotlib and Pandas documentation are good reads. In addition, Matplotlib and Pandas are incredibly well served by searching the web. Almost any question you have will have a pretty decent solution on the first page.